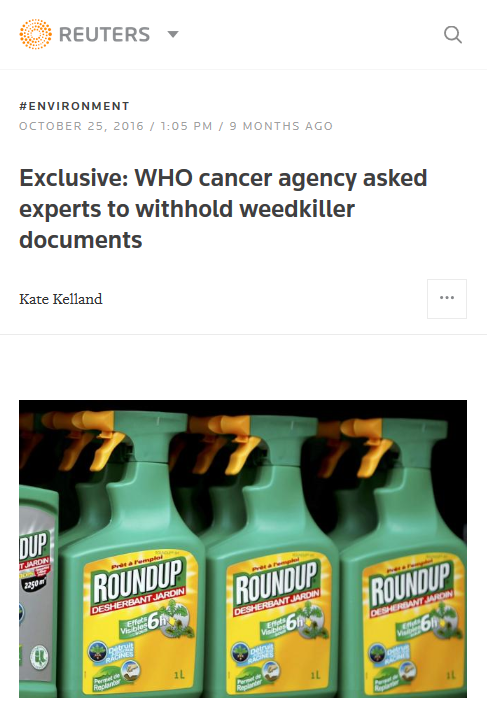 Continuing her record of industry-biased reporting about the International Agency for Research on Cancer (IARC), Reuters reporter Kate Kelland again attacked the science panel with an Oct. 19 story that the panel edited a draft scientific document before issuing the final version of its assessment on glyphosate that found glyphosate a probable human carcinogen. Kelland’s story quoted a Monsanto executive claiming that “IARC members manipulated and distorted scientific data” but failed to mention the significant amount of evidence that has emerged from Monsanto’s own documents through court-ordered discovery that demonstrate the many ways the company has worked to manipulate and distort data on glyphosate over decades. The story also failed to mention that most of the research IARC discounted was Monsanto-financed work that did not have sufficient raw data to meet IARC’s standards. And though Kelland cites a 1983 mouse study and a rat study in which IARC failed to agree with the original investigators, she failed to disclose that these were studies financed by Monsanto and the investigators IARC failed to agree with were paid by Monsanto. She also failed to mention the critical information that in the 1983 mouse study, even the EPA toxicology branch did not agree with Monsanto’s investigators because the evidence of carcinogenicity was so strong, according to EPA documents. They said in numerous memos that Monsanto’s argument was unacceptable and suspect, and they determined glyphosate to be a possible carcinogen. By leaving out these crucial facts, and by twisting others almost inside out, Kelland has authored another article that serves Monsanto quite well, but victimized innocent members of the public and policy makers who rely on trusted news outlets for accurate information. The only encouraging point to be taken from Kelland’s story is that this time she admitted Monsanto provided her with the information. 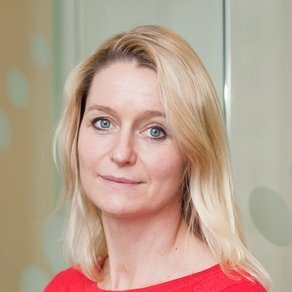 As we have previously reported, Kelland’s earlier reporting on IARC has been deeply problematic; her stories have contained errors that Reuters refused to correct, made blatantly misleading claims about documents that were not provided to the public, and relied on industry-connected sources who were presented as independent sources. The story below by Stacy Malkan, originally published in Fairness & Accuracy in Reporting, documents these examples. This Monsanto document describes the company’s public relations plan to “orchestrate outcry with IARC decision” in anticipation of the agency’s cancer rating on glyphosate. The PR plan names Sense About Science, a London based lobbying group, as a “Tier 2” ally and suggests the group could lead media outreach efforts against IARC. Sense About Science is the sister group of Science Media Center, a corporate-funded PR firm in London with close ties to Kelland (as documented in the story below). Ever since they classified the world’s most widely used herbicide as “probably carcinogenic to humans,” a team of international scientists at the World Health Organization’s cancer research group have been under withering attack by the agrichemical industry and its surrogates. One key weapon in industry’s arsenal has been the reporting of Kate Kelland, a veteran Reuters reporter based in London. With two industry-fed scoops and a special report, reinforced by her regular beat reporting, Kelland has aimed a torrent of critical reporting at the WHO’s International Agency for Research on Cancer (IARC), portraying the group and its scientists as out of touch and unethical, and leveling accusations about conflicts of interest and suppressed information in their decision-making. But in writing about the IARC decision, Kelland has ignored much of the published research backing the classification, and focused on industry talking points and criticisms of the scientists in seeking to diminish their analysis. Her reporting has relied heavily on pro-industry sources, while failing to disclose their industry connections; contained errors that Reuters has refused to correct; and presented cherry-picked information out of context from documents she did not provide to her readers. Raising further questions about her objectivity as a science reporter are Kelland’s ties to the Science Media Centre (SMC), a controversial nonprofit PR agency in the UK that connects scientists with reporters, and gets its largest block of funding from industry groups and companies, including chemical industry interests. SMC, which has been called “science’s PR agency,” launched in 2002 partly as an effort to tamp down news stories driven by groups like Greenpeace and Friends of the Earth, according to its founding report. SMC has been accused of playing down the environmental and human health risks of some controversial products and technologies, according to multiple researchers who have studied the group. Kelland’s bias in favor of the group is evident, as she appears in the SMC promotional video and the SMC promotional report, regularly attends SMC briefings, speaks at SMC workshops and attended meetings in India to discuss setting up an SMC office there. Neither Kelland nor her editors at Reuters would respond to questions about her relationship with SMC, or to specific criticisms about her reporting. Fiona Fox, director of SMC, said her group did not work with Kelland on her IARC stories or provide sources beyond those included in SMC’s press releases. It is clear, however, that Kelland’s reporting on glyphosate and IARC mirrors the views put forth by SMC experts and industry groups on those topics. On June 14, 2017, Reuters published a special report by Kelland accusing Aaron Blair, an epidemiologist from the US National Cancer Institute and chair of the IARC panel on glyphosate, of withholding important data from its cancer assessment. 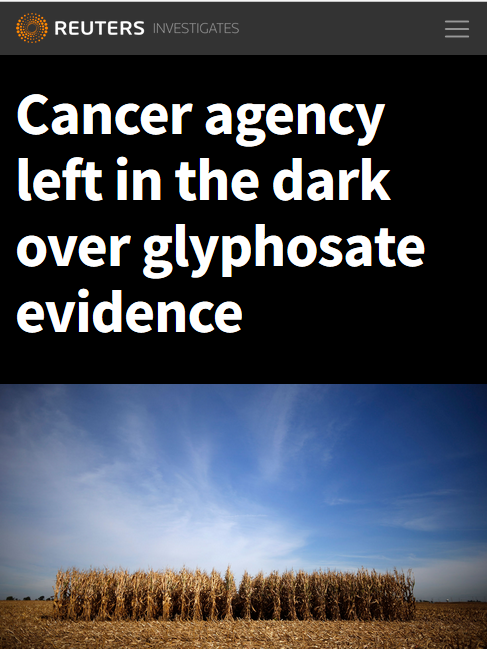 Kelland’s story went so far as to suggest that the information supposedly withheld could have changed IARC’s conclusion that glyphosate is probably carcinogenic. Yet the data in question was but a small subset of epidemiology data gathered through a long-term project known as the Agricultural Health Study (AHS). An analysis of several years of data about glyphosate from the AHS had already been published and was considered by IARC, but a newer analysis of unfinished, unpublished data was not considered, because IARC rules call for relying only on published data. Kelland’s thesis that Blair withheld crucial data was at odds with the source documents on which she based her story, but she did not provide readers with links to any of those documents, so readers could not check the veracity of the claims for themselves. Her bombshell allegations were then widely circulated, repeated by reporters at other news outlets (including Mother Jones) and immediately deployed as a lobbying tool by the agrichemical industry. After obtaining the actual source documents, Carey Gillam, a former Reuters reporter and now research director of US Right to Know (the nonprofit group where I also work), laid out multiple errors and omissions in Kelland’s piece. The analysis provides examples of key claims in Kelland’s article, including a statement supposedly made by Blair, that are not supported by the 300-page deposition of Blair conducted by Monsanto’s attorneys, or by other source documents. Kelland’s selective presentation of the Blair deposition also ignored what contradicted her thesis—for example, Blair’s many affirmations of research showing glyphosate’s connections to cancer, as Gillam wrote in a Huffington Post article (6/18/17). Reuters has refused to correct the errors in the piece, including the false claim about the origin of the source documents and an inaccurate description of a key source, statistician Bob Tarone, as “independent of Monsanto.” In fact, Tarone had received a consultancy payment from Monsanto for his efforts to discredit IARC. We have reviewed the article and the reporting on which it was based. That reporting included the deposition to which you refer, but was not confined to it. The reporter, Kate Kelland, was also in contact with all the people mentioned in the story and many others, and studied other documents. In the light of that review, we do not consider the article to be inaccurate or to warrant retraction. Williams declined to address the false citing of “court documents” or the inaccurate description of Tarone as an independent source. Since then, the lobbying tool Reuters handed to Monsanto has grown legs and run wild. A June 24 editorial by the St. Louis Post Dispatch added errors on top of the already misleading reporting. By mid-July, right-wing blogs were using the Reuters story to accuse IARC of defrauding US taxpayers, pro-industry news sites were predicting the story would be “the final nail in the coffin” of cancer claims about glyphosate, and a fake science news group was promoting Kelland’s story on Facebook with a phony headline claiming that IARC scientists had confessed to a cover-up. This was not the first time Kelland had relied on Bob Tarone as a key source, and failed to disclose his industry connections, in an article attacking IARC. An April 2016 special investigation by Kelland, “Who Says Bacon Is Bad?,” portrayed IARC as a confusing agency that is bad for science. The piece was built largely on quotes from Tarone, two other pro-industry sources whose industry connections were also not disclosed, and one anonymous observer. IARC’s methods are “poorly understood,” “do not serve the public well,” sometimes lack scientific rigor, are “not good for science,” “not good for regulatory agencies” and do the public “a disservice,” the critics said. The agency, Tarone said, is “naïve, if not unscientific”—an accusation emphasized with capital letters in a sub-headline. Tarone works for the pro-industry International Epidemiology Institute, and was once involved with a controversial cell phone study, funded in part by the cell phone industry, that found no cancer connection to cell phones, contrary to independently funded studies of the same issue. The other critics in Kelland’s bacon story were Paulo Boffetta, a controversial ex-IARC scientist who wrote a paper defending asbestos while also receiving money to defend the asbestos industry in court; and Geoffrey Kabat, who once partnered with a tobacco industry-funded scientist to write a paper defending secondhand smoke. Kabat also serves on the advisory board of the American Council on Science and Health (ACSH), a corporate front group. The day the Reuters story hit, ACSH posted a blog item (4/16/17) bragging that Kelland had used its advisor Kabat as a source to discredit IARC. The industry connections of her sources, and their history of taking positions at odds with mainstream science, seems relevant, especially since the IARC bacon exposé was paired with a Kelland article about glyphosate that accused IARC advisor Chris Portier of bias because of his affiliation with an environmental group. The conflict-of-interest framing served to discredit a letter, organized by Portier and signed by 94 scientists, that described “serious flaws” in a European Union risk assessment that exonerated glyphosate of cancer risk. The Portier attack, and the good science/bad science theme, echoed through chemical industry PR channels on the same day the Kelland articles appeared. Kelland’s “exclusive”: A pro-industry legal group complains it can’t access the IARC’s emails. In October 2016, in another exclusive scoop, Kelland portrayed IARC as a secretive organization that had asked its scientists to withhold documents pertaining to the glyphosate review. The article was based on correspondence provided to Kelland by a pro-industry law group. In response, IARC took the unusual step of posting Kelland’s questions and the answers they had sent her, which provided context left out of the Reuters story. IARC explained that Monsanto’s lawyers were asking scientists to turn over draft and deliberative documents, and in light of the ongoing lawsuits against Monsanto, “the scientists felt uncomfortable releasing these materials, and some felt that they were being intimidated.” The agency said they had faced similar pressure in the past to release draft documents to support legal actions involving asbestos and tobacco, and that there was an attempt to draw deliberative IARC documents into PCB litigation. IARC has “secret agendas” and its actions were “ridiculous,” according to a Monsanto executive quoted in the story. The article by Reuters follows a pattern of consistent but misleading reports about the IARC Monographs Programme in some sections of the media beginning after glyphosate was classified as probably carcinogenic to humans. The Science Media Centre—which Kelland has said has influenced her reporting—does have vested interests, and has also been criticized for pushing pro-industry science views. Current and past funders include Monsanto, Bayer, DuPont, Coca-Cola and food and chemical industry trade groups, as well as government agencies, foundations and universities. By all accounts, SMC is influential in shaping how the media cover certain science stories, often getting its expert reaction quotes in media stories and driving coverage with its press briefings. That is the point of the SMC effort: to signal to reporters whether stories or studies merit attention, and how they should be framed. Sometimes, SMC experts downplay risk and offer assurances to the public about controversial products or technologies; for example, researchers have criticized SMC’s media efforts on fracking, cell phone safety, Chronic Fatigue Syndrome and genetically engineered foods. SMC campaigns sometimes feed into lobbying efforts. A 2013 Nature article (7/10/13) explained how SMC turned the tide on media coverage of animal/human hybrid embryos away from ethical concerns and toward their importance as a research tool—and thus stopped government regulations. The media researcher hired by SMC to analyze the effectiveness of that campaign, Andy Williams of Cardiff University, came to see the SMC model as problematic, worrying that it stifled debate. Williams described SMC briefings as tightly managed events pushing persuasive narratives. On the topic of glyphosate cancer risk, SMC offers a clear narrative in its press releases. The IARC cancer classification, according to SMC experts, “failed to include critical data,” was based on “a rather selective review” and on evidence that “appears a bit thin” and “overall does not support such a high-level classification.” Monsanto and other industry groups promoted the quotes. SMC experts had a much more favorable view of risk assessments conducted by the European Food Safety Authority (EFSA) and the European Chemicals Agency (ECHA), which cleared glyphosate of human cancer concerns. In other words, IARC is tasked with highlighting anything that might in certain conditions, however rare, be able to cause cancer in people. EFSA, on the other hand, is concerned with real life risks and whether, in the case of glyphosate, there is evidence to show that when used in normal conditions, the pesticide poses an unacceptable risk to human health or the environment. We listen carefully to any criticism from the scientific community or news journalists working for UK media, but we do not receive criticism of pro-industry bias from these stakeholders. We reject the charge of pro-industry bias, and our work reflects the evidence and views of the 3,000 eminent scientific researchers on our database. As an independent press office focusing on some of the most controversial science stories, we fully expect criticism from groups outside mainstream science. Scientific experts do not always disclose their conflicts of interest in news releases issued by SMC, nor in their high-profile roles as decision-makers about the cancer risk of chemicals like glyphosate. Frequent SMC expert Alan Boobis, professor of biochemical pharmacology at Imperial College London, offers views in SMC releases on aspartame (“not a concern”), glyphosate in urine (no concern), insecticides and birth defects (“premature to draw conclusions”), alcohol, GMO corn, trace metals, lab rodent diets and more. The ECHA decision that glyphosate is not a carcinogen “is to be congratulated,” according to Boobis, and the IARC decision that it is probably carcinogenic “is not a cause for undue alarm,” because it did not take into account how pesticides are used in the real world. ILSI has received six-figure donations from Monsanto and CropLife International, the pesticide trade association. Professor Angelo Moretto, who co-chaired the UN panel on glyphosate along with Boobis, also held a leadership role in ILSI. Yet the panel declared no conflicts of interest. We ask all researchers we use to provide their COIs and proactively make those available to journalists. In line with several other COI policies, we are unable to investigate every COI, though we welcome journalists doing so. And so goes it with the tangled web of influence involving corporations, science experts, media coverage and the high-stakes debate about glyphosate, now playing out on the world stage as Monsanto faces lawsuits over the chemical due to cancer claims, and seeks to complete a $66 billion deal with Bayer. Messages to Reuters may be sent through this website (or via Twitter: @Reuters). Please remember that respectful communication is the most effective. UPDATE January 2019: Documents filed in court show that Monsanto provided Kate Kelland with the documents for her June 2017 story about Aaron Blair and gave her a slide deck of talking points the company wanted covered. See Carey Gillam’s post. See also June 19, 2017 story by Carey Gillam, Monsanto Spin Doctors Target Cancer Scientist In Flawed Reuters Story.